In the remote Watkins Mountains lie the three highest peaks in the Arctic; Gunnbjørnsfjeld (3693m), Dome (3682m) and Cone (3669m). Make ascents of all three of these mountains over a two week period, or join Tangent Expeditions just for the first or second weeks. The full two weeks is highly recommended to fully experience the beauty of this area and give the team the highest possible chance of summitting all three peaks. 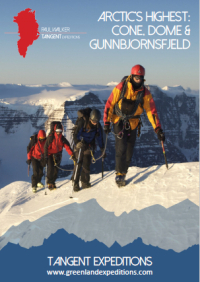 Gunnbjørnsfjeld is often referred to as the "8th summit" amongst those wishing to add to their 7 Summits challenge. The expedition will begin with a private charter flight into the Watkins Mountains, travelling direct from Iceland or via Constable Point as conditions dictate. 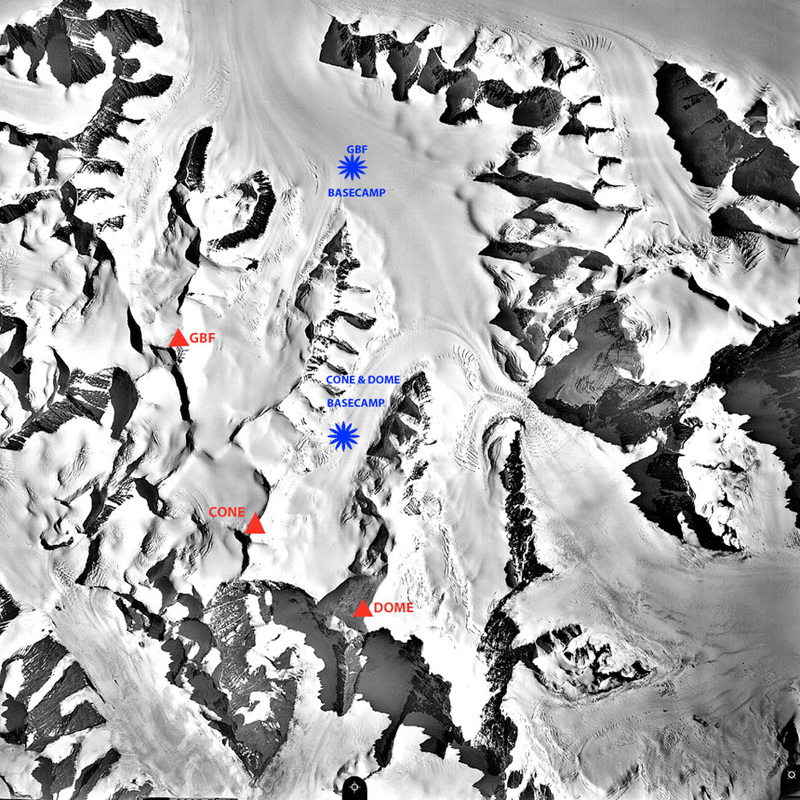 You'll establish base camp close to where the ski-equipped Twin Otter aircraft lands. After a few days of acclimatisation, you'll aim to summit Gunnbjørnsfjeld in a day from your base camp. The following week, ascents of Dome and Cone will follow, together with other peaks in the area if time and conditions permit. Expect summit days of 10-12 hours. The ascents will involve easy angle ski ascents/descents on large glaciers. The final few hundred metres of each ascent will be on foot and involve mainly moving together on easy slopes with the occasional rope length of grade 1 (40 degree) slopes. May in the Watkins Mountains is usually relatively warm, with overnight temperatures around -15°C, and daytime highs usually up to +10°C, although much colder temperatures have been experienced by previous groups. Daytimes are likely to feel warm as the sun reflects off the snow. There will be 24-hour daylight throughout your trip. Day 1: Team meets in Akureyri, Iceland for the flight to the Watkins Mountains. Day 2: Establish base camp in the Watkins Mountains. Days 3-7: Climb Gunnbjørnsfjeld after appropriate acclimatisation. Day 8: Clients only attempting Gunnbjørnsfjeld depart; clients only attempting Dome & Cone arrive. Days 9 - 14: Climb Dome and Cone. Day 15: Return flight to Iceland. Participants should be fit and capable of 10+ hour mountain days with a 10kg pack, with longer days on main summit days. You should have no significant knee or back problems. On the glaciers, you can choose to travel by either ski or snowshoe. Skiers should be strong intermediate level, able to ski blue/red runs in variable conditions. No previous snow shoe experience is required. Basic winter climbing knowledge is preferred, including the use of a harness, tying into a climbing rope and using crampons and ice axes. Prior camping experience is essential, but winter camping experience is not as full training will be given in the use of expedition tents and multifuel stoves. You will be required to cook for yourself.